Are you buying a new house? Moving your business? A great way to find quality movers is to look at reviews! Customers love to share their experiences with each other. While you need to do other research on your Nashville Moving Company reviews will tell a story. 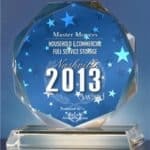 Master Movers are among the best reviewed movers in Nashville earning your trust for over 13 years! One of the many things that make our movers the best is that we take into consideration that every customer is unique. Our movers may move people every day, they are experienced and comfortable with the routine. With that being said they also know You don’t move every day. For you, the customer, this is a special day! Your getting that new house, that’s exciting! Our movers help make sure it stays that way. When hiring Movers we take several things into consideration. Just to give you an example of some of the requirements Master Movers has of our employees. Number 5 is a big one, when conducting an interview with a potential mover I always ask myself, now if I was home alone, and I am a woman would I feel secure with these men in my home? The answer to this question must be an absolute Yes or it’s a no go for the candidate. Movers in general have a reputation for being pretty rough around the edges, our goal is to change that reputation and lead by example! The men and women who work at Master Movers are clean, polite, and experienced! Whoever you choose to complete your upcoming move we wish you the best of luck and hope you have a great experience. We would love to hear some of your moving stories! Feel free to share with us.